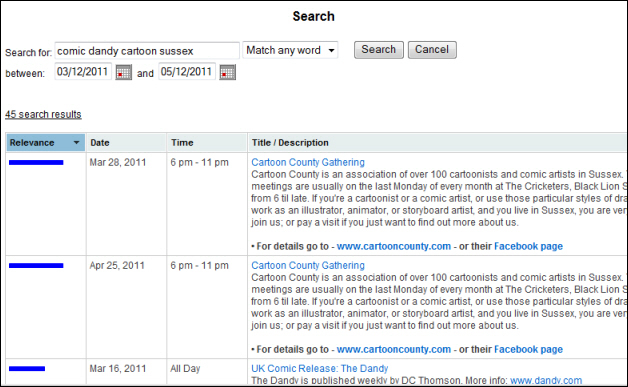 For a while now, many of you have been asking for a way to search within your calendars. You wanted to let visitors Search inside your public calendars, too. Some of you might be wondering: What happened to the "local search" I used to have on the Left menu? Don't worry; it will make return shortly with some new features added. By the way, you now might have up to 4 buttons at the bottom of your published calendar: Add Event, Search, Discussion Forums, and Printable View (if you've enabled all those features). Kind of a little crowded, we know. We'll be doing something shortly to make that more streamlined so stay tuned. Is there going to be the USER availability to prevent having the search box appear on the bottom of the published calendar ? Wow. . . . joined in 2005 and still a newbie ? Since it's position at the bottom is actually only temporary, we wont be immediately adding an option to turn it off. But as we also have a flag that lets you hide the RSS and iCal options, we'll most likely add one for Search as well. Sorry about being a bit of a wet rag. . . in my particular circumstance, in the published calendar, folks (my website users) are more interested in the events of the the current block monthly view, maybe even looking month in advance. . . but beyond that very very remote anybody would be looking to search farther. . . .
For my own use while working/editing the calendar, the search box function is a great tool for me in the "non-published" view while performing edits or updates of calendar events. Ahhhh thank you. . . . . .
what is even GREATER is the option to use it or not! It would be nice to be able to get to the event to edit from the search results. We have plans to add merged and imported iCal calendars to the search, which are not going to be editable. However, when we roll out that code, we do plan on jumping to the Editor for events that are located on your calendar. While we don't allow you to export a specific date range, the day,week, and month views do take a start_date parameter if you want to see all events for a specific 1, 7 or 30-ish range respectively. Oh, and of course you can just use the mini calendar on the left menu to navigate to a specific date and see what events you have entered there.